Using Wipneus's calculation of extent and area, which like my own calculations using PIOMAS gridded data is based on Cryosphere Today's regions, it is possible to work out regional extent, area, and compactness. Compactness is a vital metric of sea ice state, it is defined as the ratio Area / Extent and gives a measure of dispersion of ice. One can gain a similar picture using PIOMAS Gice sub grid volume statistics, but to avoid diversionary bleating about models I prefer to concentrate on the compactness metric for this post. 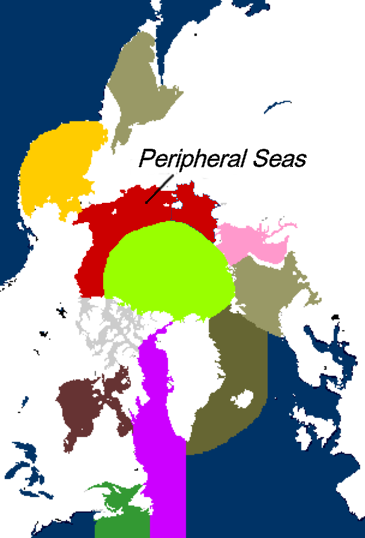 A critical region in the Arctic is the composite region of Beaufort, Chukchi, East Siberian, and Laptev Seas, this is a region I have called the Peripheral Seas (of the Arctic Ocean Basin). The region is shown in red in the following graphic. This is a critical region because in order to open up late summer inroads into the Central Arctic (green centre of the above map), early melt out of the peripheral seas is needed. Over the coming decades as the Arctic Ocean continues its 'slow transition' to a seasonally sea ice free state, early melt in the peripheral seas is crucial for the Central Arctic to melt out by September. So ice state in the Peripheral Seas region is a critical metric in determining whether the Arctic Ocean's ice pack is indeed stabilising or recovering. 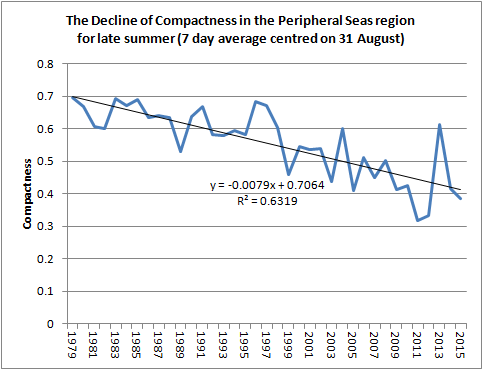 Here is a plot of compactness for late summer in the Peripheral Seas from 1979 to 2015, where late summer is the seven day average centred on 31 August. If one takes the extent as determining the ice edge, extent being the region with more than 15% ice cover, then in the Peripheral Seas, as their transition towards a seasonally ice free state proceeds, ice cover within the ice edge at the end of summer has dropped from around 60% to 70% early in the series down to around 40% in recent years. 2015 was on the long term trend. Claims that there is no ongoing deterioration in Arctic sea ice are totally unfounded, and it is safe to ignore those making such claims as being unreliable due to their lack of grasp of the subject. Speaking of those who misrepresent data to generate extreme conclusions, I would say jai mitchell and abruptslr fit the other end of the spectrum. Would I be unreasonable in saying that? I am already unpopular enough, so at present decline to name names on the alarmist side. This does not mean that I agree with you regards those specific people. However, I have commented elsewhere that I often find similarity between doomers and deniers, in them a circle meets, opposite to where the vast majority of the scientific community are. I do consider AMEG and some of their hangers-on to be doomers. I have a graphic ready for when I am moved to post my thoughts on this. Can we email about this?